I have always wanted to write an obituary but I always thought it would be my own, not that of my friend Ann O’Brien, who died on July 1, 2006, twenty days shy of her 55th birthday. Her sister Betsy O’Brien told me I could make it long. Ann O’Brien is now playing with my dead dogs, cats, her grandparents, Carmen and Leandre Marechal and Mary and William O’Brien, her Uncle Rene Marechal, her dear friend Elliot Snellings, other family members, my parents, friends, and total strangers, because that was the kind of person she was and still is. Ann is survived by her wacky but loving husband, John Preble, and sons, Andrew and William Preble, of Abita Springs. She is also survived by her parents Alyce “the storyteller” and Charlie “God-Loves-You” O’Brien of Covington along with her sisters, Christine Lozes and her husband Bill and their children, Brian and Allison, of Covington, Betsy O’Brien of Washington D.C., brothers Michael O’Brien of Folsom and his children Wesley of New York and Chris of New Orleans, and David O’Brien and his wife Lillian and children Maegan and Sean, of Mandeville. She is further survived by her mother and father-in-law, Marie-Louise and Warren Preble, her brother-in law Warren Preble and his friend Lillian, Uncle Paul “Brother Elias” Marechal, and Uncles Willam and Edward O’Brien and their families. And oh-my-gosh so many friends, more friends than anyone I’ve ever known, at least two thousand six hundred and forty-nine of them, including myself, Francie Rich, and my husband John Hodge, and others who can’t be listed because they didn’t pay to have their names listed in this obituary. Ann O’Brien was born on a really poor sharecropper’s farm in Oklahoma…skip that part, I’m saving that for my obituary. Ann graduated from St. Scholastica Academy in Covington and, as long-time SSA teacher Alyce O’Brien remembered her, she was a “pleasant child, with street smarts instead of book smarts.” Oh, I’m sorry, she was referring to Cathy Deano, not Ann. 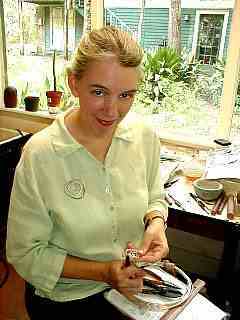 Ann studied painting and got her BFA at LSU before becoming the famous jeweler she is today. She was a president of the Louisiana Crafts Council, a member of the Rhino Gallery in New Orleans, the Mississippi Craftsmen’s Guild and a host of other organizations. Her work has appeared in national publications and has been exhibited in fine crafts shops around the country. As Ann perfected her craft she also perfected the craft of helping other artists sell their work. In addition to her own work and helping other artists, she has done extensive volunteer work with children. She also worked as an artist-in-residence in St. Tammany Parish schools and as a tutor at Mercy Family Center in Mandeville. She and her husband, John Preble, founded the UCM Museum in Abita Springs, where Ann loved leading the Push Mow Parade on her bicycle. She traveled with her grandparents to Europe as a child and made yearly visits to Uncle Paul at the Trappist monastery near Atlanta and to Navarre Beach, Florida. Ann didn’t like to be alone and she never was and isn’t now. Ann was diagnosed with pancreatic cancer earlier this year. She never liked going to doctors but ended up caring deeply for her doctors, Drs. Carinder, McCormick, Saux, Suarez, Groves, Seicshnaydre, Ehrensing, Bobrowski, and Torcson. Her hospital room was party central and the place to be. Ann’s illness turned out to be an incredible gift to her family and friends. Her room was always full of laughter, love and joy. Personally I’m not one for large group gatherings, but I loved going to see her in the hospital and at her parents’ house, where her mother would tell fabulous stories and I met old and new, all wonderful people who have enriched my life. Whenever Ann called she would say, “Hi, this is Ann O’Brien,” as if her thin shaky voice and caller ID didn’t give her away. She didn’t like change, so dying is a major step for her. She laughed easily, could talk about anything to anyone and her only fault was that she never talked ugly about anyone. She is the epitome of a gentle soul even when she got mad at John Preble, which to know him is to get mad at him. She was kind and generous and we are still expecting great things from her. Ann treasured the trees on her property in Abita Springs. She would often give us plants and trees and office supplies for Christmas gifts. Hurricane Katrina took most of her trees in Abita. Maybe she went to be with them. Many of us will think of Ann when we see camellias, azaleas, and trees. One consolation of dying young is having a large funeral, and anyone who could figure out a way to sell tickets to Ann’s would be set up for life. John Hodge had a dream at the moment Ann died. Ann was driving a truck in Mexico then riding a bicycle with flowing skirts. He kept thinking, “doesn’t anyone know she is sick?” She fell off her bicycle and everyone “tackled” her with love. When it’s your turn to go, be sure to look for Ann if she’s not already at the entrance waiting for you. My only regret is that Ann didn’t have a goofy nickname. Please feel free to send flowers, plants, or trees, or send donations in Ann’s memory to the Leonard C. Thomas Hematology and Oncology Specialists Foundation, 339 Starburst Circle, Covington, LA 70433, (985) 892-9090. Relatives, friends and total strangers are invited to attend the Memorial Mass at St. Benedict Catholic Church, 20307 Smith Road, Covington, LA 70435, at 11:00 a.m. on Monday, July 3, 2006. E.J. Fielding & Sons is in charge of arrangements.